A man smoked a cigarette as he waited to unload his delivery of newspapers headlining the inauguration of the 45th President at the Embassy Suites in Alexandria, VA. My watch read 5:18 a.m. as I swiped my metro card to board the first ride of the day from Kings Station. The stop was quiet, with only five other passengers waiting. Upon arrival, I saw that the expected crowds must have been sleeping, and decided to watch the day begin from the Lincoln Memorial. Two men in tuxes with untied bows around their necks passed me in a haze. The transition from a Trump celebration to the Women’s March on Washington ended as the sunlight arrived. The movement was headed by four national co-chairs and a national committee who organized Saturday’s event. Though the registered number of marchers was 200,000, the turn out was easily half a million people—100,000 more than city officials planning security had expected. The Women’s March represented the largest civil protest in American history—larger than both the Nixon protest of 1973 and that of Bush in 2001. The activist action may have begun as a grassroots effort by Hawaii attorney Teresa Shook, but the end result yielded a well planned and designed event with more than 100 sponsors and partners including: Planned Parenthood, NAACP, Oxfam, ACLU and Human Rights Watch. With so many diverse partners scheduled to speak, the rally lasted two hours longer than planned. Cecile Richards, President of Planned Parenthood, took the stage in a fuchsia blazer and announced, “we are not going to take this lying down.” Sophie Cruz stood with her family as she recited her speech in both English and Spanish. Cruz tapped into communal emotions with her innocent voice garnering empathy as she lead the chant, ”Sí se puede,” yes we can. The Indigo Girls performed for a subdued crowd an hour and fifteen minutes after the rally was supposed to have moved to action. One marcher announced, “they’ve been talking for five hours. I’m just saying, I am here to march, not bump elbows with everyone.” Crowds grew restless, and some moved to march ahead of the rally while other retreated to avoid panic attacks. A palpable energy and excitement pulsed through those staying behind who were rewarded with a performance from Alicia Keys as well as Madonna, who was introduced by Amy Schumer. 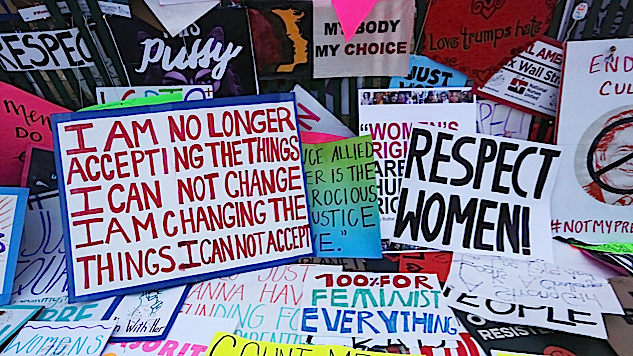 While each speaker expressed her own ideas, ranging from religion and consent to education and reproductive rights, there was one overall distinction between the Women’s March rally and the walk itself. The event’s website states that the gathering would “attack forces of evil, not persons doing evil.” Rather than solely protesting Trump, organizers used this time of unity to illuminate intersectional feminism and women’s rights as fundamental human rights in an effort to bring the issues to the forefront of our nation’s mind. The slow progression to the Ellipse was filled with chants not of unity or in remembrance of those we have lost due to police brutality, but with the sole intention of targeting Trump. There is no better example than that of Sybrina Fulton taking part in a call and response rally cry of “Say his name – Trayvon Martin” compared to the protesters’ obscenities as they passed Trump’s International Hotel on Pennsylvania Avenue. Even among rightly rowdy women, the atmosphere remained friendly and courteous. Privilege and entitlement had no place among this group who worked together to help one another throughout the day. In the upsetting event that a person would lose their way, have a panic attack due to the claustrophobic environment or even a heart attack, a team effort to resolve the issue prevailed. Even a policewoman enforcing the barricade surrounding Trump’s hotel stated that this has “been a great crowd,” despite the rumbling cries of “shame” that echoed down Pennsylvania Avenue as marchers pooled in front of Trump’s giant conflict of interest. Another activist, Pamela Mays McDonald of Oakland, CA, distinguished the character of those attending the Women’s March from rioters. “Lighting fires is a little boy’s thing. We give birth,” McDonald said just before a participant threw his sign at the police standing guard between the Ellipse and the White House. The procession was one of excitement and hope united by years of anger and aggravation. Supporters lined rooftops of buildings along Pennsylvania Avenue, and even cheered and waved from the second floor of a CVS. Symbols of peace were laced throughout the streets from flags to a pink carnation a policeman held up from the passenger’s window of a white van caravan that escorted celebrity speakers away as a cheer of appreciation for the solidarity rose from those the car passed. In the final steps leading to the Ellipse, activists of all ages passed a quote from Frederick Douglass: “Power concedes nothing without demand. It never did and it never will.” Though Douglass stated this wisdom in 1857, the idea holds true today. We cannot receive what we do not ask for. The signs placed along the concrete Jersey barrier like flowers at a national memorial broadcast the hopes and fears of the nation before the White House. As the march dissipated, I stood watching a mother and her daughter—approximately six years old—wind their way to the front of the Ellipse. Though the daughter wore a gas mask around her neck in fear of facing tear gas, she still wanted to glimpse the President’s residence. Her resilient hope is one that America must now practice as we stand together, hoping to wring concessions from power.